She frames her poems experimentally. Stepping back onto a vibrant surface after a sudden polaroid encounter, she then re-hangs the frame. I am impressed by the glowing areas of these poems. 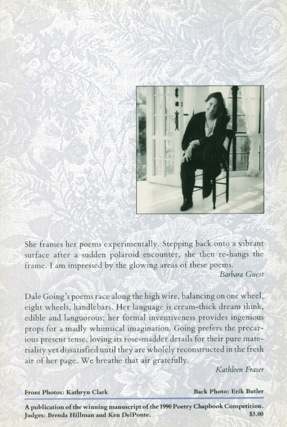 Dale Going’s poems race along the high wire, balancing on one wheel, eight wheels, handlebars. Her language is cream-thick dream think, edible and languourous; her formal inventiveness provides ingenious props for a madly whimsical imagination. Going prefers the preacrious present tense, loving its rose-madder details for their pure materiality yet dissatisfied until they are wholely reconstructed in the fresh air of her page. We breathe that air gratefully. 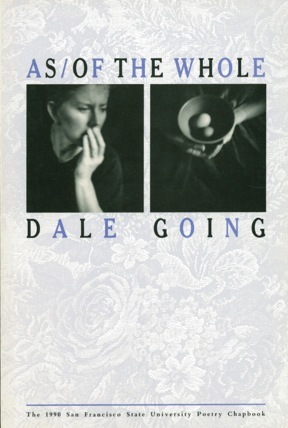 The title of Dale Going’s book with its ‘cubist’ slash mark signals its postmodernism, an attention to and play with language, an attention to process and form in themselves… The book creates an effect of framing, as if poems, poet, and reader were placed within concentric frames, but any and all frames could be shifted at a moment’s notice. Yet, instead of being cold and ‘formalist,’ the book is written with grace and humor as well as a compelling authorial presence. Images stack up but do not clutter like the magic house, always a new door to open into… Or reverse motion where rooms are disappearing as one backs out of them, as in “Something About Absence.” The words revealed in “Passionate,” the first poem in the series, are then rearranged, deleted, and give the feeling of their titles: “Constructed,” “Narrative,” “Broken,” “Coda.” Each poem a memorial, the same one wearing down to the essential image and white. Two things dropped out of pockets at the film. Finding a second amethyst on the airplane (for his mother). This Is Your Doing, Woman! Are You Not Afraid? Set in Bembo and printed by university Printing Services at SFSU. Cover printed at West Coast Print Center, Berkeley. Cover photographs by Kathryn Clark, untitled diptych (Woman and Eggs)©1989; from the series, mindful affection; original color prints, 30 x 60. Cover design: James McElheron and Dale Going. Book design: Paul Bailiff, Dale Going, and Mary Hazlewood.